Black couples showed significant improvements in the relationship quality six months after completing a nine-hour marriage education class. 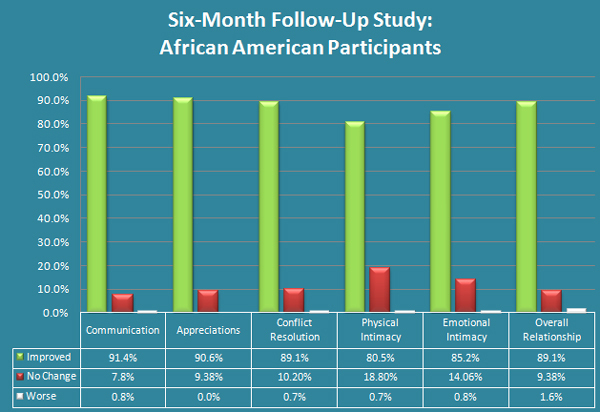 Black couples showed significant boosts in relationship quality six months after completing a nine-hour marriage education designed to strengthen communication, emotional understanding, and conflict resolution skills. In a study by the PAIRS Foundation of 128 black participants in marriage education classes, 89 percent reported improvements in their overall relationships six months after course completion; less than two percent reported declines. 98% said they would recommend the class to others. The percent of participants who reported never considering divorce, separation, or terminating their relationship increased 41 percent. The frequency of arguments dropped more than 50 percent. For the study, PAIRS Essentials classes were delivered by non-mental health professionals in schools, churches and community organizations in Miami-Dade and Broward County over three consecutive weeks. Eighty two percent of participants in the study were married; more than half have minor children living at home. The mean age was 42 years old. Seth Eisenberg, President and CEO of PAIRS Foundation, said the findings offer important guidance for improving the economic vitality of distressed neighborhoods and outcomes for children. “Strong marriages and families are critical building blocks for economic and career success for adults, improving educational achievement and health for children, and creating safe, stable communities,” Seth Eisenberg said. “The rate of marital and family breakdown in the black community is significantly higher than other groups. Nationally, the percentage of married black adults is nearly 53 percent less than whites. In the most highly distressed neighborhoods, the difference is even greater,” he said. Amanda Falciglia, PAIRS Foundation’s Research Director, said the findings for African American participants are consistent with studies of other ethnic groups. I just want to say that, every marriage or relationship will go through hard times every now and then. It is impossible for a marriage to go years without developing some type of issues. However, when tough times present themselves in a marriage it’s up to both spouses to take action and do something, or their marriage may not survive the tough times it is going through.